“What goes around comes around.” So said the Karate Kid. A similar thought is found in Galatians 6:7: “Whatever one sows, that will he also reap,” Hosea 8:7: “They sow the wind and they shall reap the whirlwind,” and in the words of Jesus: “…the measure you give will be the measure you get” (Matthew 7:2). do not dress or wear their hair in any way that would distinguish them from the communities in which they live. “That’s the reason we take exception to this kind of writing,” Mr. Cook said. understand Jesus’ atonement is sufficient to cleanse from all unrighteousness. “Men Are Gods in Embryo…Man is the child of God,… so the undeveloped offspring of celestial parentage is capable, by experience through ages of aeons, of evolving into a God. Nothing could be further from the truth with respect to members of the Christian church. Mormonism is not Christianity and Christianity is not Mormonism. They are entirely separate. If the LDS Church (and others) would stop using the word “Christian” in connection with those who practice polytheism (defined as “belief in or worship of more than one God), it would make it so that everybody understood the situation better. And we would appreciate it. From where I stand, Mormonism appears to have had a “reformation” in the very early days of the 20th century. This “reformation” correspondeds to Utah wanting to become a state in the Union and the controversy surrounding the Reed Smoot senate hearings. Smoot was trying to be seated as the U.S. senator from the new state. The hearings, which went on for a couple of years, basically took Mormonism a part brick-by-brick and examined it’s teachings and practices. The newspapers were ablaze with information coming out of the hearings. It was quite sensational. As a result of this, Mormonism was forced to make significant changes, not as a result of revelation, but because of societal pressure. The Mormon church even excommunicated two of their apostles. My point is that in the last 100 years Mormons have adapted and changed to “look” like a mainstream protestant denomination. But underneath they are a distinctive religious sect with doctrines that are so far from mainstream Christianity as to wonder why they would even want to be known as “Christian”. That claim is offensive to the Body of Christ. I wish Mormons would just own who they are and not masquerade as something they are not. Amen, Sister! This is what I’ve been trying to explain to members of the LDS church for the last 20 years. I still don’t understand why they and some of the secular community just don’t get it. I guess it’s easier to “anti” Mormon bash than to take a good look at what we are really saying. Then come to the conclusion that we aren’t “anti” after all. Well said, Sharon. The analogy is perfect and one that we should make use of every time the issue comes up. This is outstanding. This sort of argument opens a door for truth to reign. You know, in the 19th century there were many different denominations of the protestant church. So then why were they given another name? It was imperative to the members of the Christian church to put a name on members of the LDS faith to distance themselves from them. This is what many LDS do not understand when statements like “we’re christians like you” are made. The truth is that the Christian families in and just outside Nauvoo were disgusted with the Polygamy (the primary polygamy of Joseph Smith and a few other early LDS apostles, D and C 132). The families did not want their children growing up and seeing these men with many wives with the name “Christian”. It would be confusing to them. So the name Mormon (coming from the book) was no accident, or a name that was just commonly used for the LDS. It was very much a defense mechanism to show that the LDS were not of the Christian faith, and likewise their practices were not parallel to that of what Christ taught. Does this mean we can go back to calling the Mormon Church the “Mormon Church” instead of (take a deep breath) “The Church of Jesus Christ of Latter-day Saints”? From a 19 February 2001 New York Times article, quoting Dallin H. Oaks: “I don’t mind being called a Mormon, but I don’t want it said that I belong to the Mormon Church.” Yes, this certainly does create a lot of confusion. The common person who thinks of Mormons usually thinks polygamy. There is no way to escape it. If Mormons owned up to the truth they would be exposed for the made up religion they are. I agree entirely with the premise of this post. Christians have fundimental beliefs which the Mormon church by thier very doctrine separates themselves from the body of Christ. However, I believe this appeal will not happen for two reasons. First, Mormons think they are Christian. In fact they think they are the ultimate definition of Christians, or Christians in the truest sense. There is a notion within the LDS church, that other churches have a portion of the truth. However, they believe they have all the truth. When you point out that a fundimental definition of Christianity is belief in the existance of one God and only one God, it falls on deaf ears because we Christians don’t know ‘the fundimental nature of God’, in thier view anyway. I think a lot of this goes back to the central role that Jesus does play in thier theology. Although thier view of Jesus I find very distorted, He is central to thier plan of salvation. The second reason why this admission will not happen, is that doing so would deligitimize thier reason for existing. In the Mormon perview, Joseph Smith restored the original New Testiment Church. It doesn’t matter that there isn’t much evidence that the NT church looked anything like the modern LDS church. Remember, the bible isn’t translated correctly; plain and precious truths have been removed. It all goes back to believing that Joseph Smith claimed he had visions of God and Jesus telling him to restore Christianity. It doesn’t matter that there are 13 different first vision accounts that differ significantly. The current version (of two personages) just happened to be AFTER Smith had arrived at a theology that was polytheistic. To me, this explains why the BOM reads like monotheism (i.e. when Smith wrote the BOM, he was still thinking monotheisticially). To a Christian like myself, I think I’ll just put my faith in Jesus, rather than a person who made many foibles who told an ever evolving story. Mormon leaders had to make a decision in the late 19th and early 20th century as to whether they were going to remain an isolated theocratic polygamist religious sect or if they were going to jettison their most egregous practice and join the rest of the United States both politically and in marital practice. The pressure on the sect was intense and they decided to capitulate. This, however, did not go over well with a segment of the Mormon population. Ergo the FLDS who have remained “wedded” to the teachings and practices of the Prophets Smith and Young. The dumping of polygamy allowed the LDS to move within acceptable limits of the religious spectrum. Overall the LDS church can blend in as long as they don’t broadcast how they are different from mainstream Christianity. That’s why, in the early part of the 20th century, they decided to emphasize Joseph Smith’s “first vision”. A prospect isn’t going to hear the rest of the story until the hook is set. The average person has no idea how Mormonism differs from mainstream Christianity. And Mormons are more than happy to maintain that fog bank. BYU offers no degrees in theology or divinity, other than what is best described as “apologetics,” useless outside the Mormon community. BYU undergraduates are required to take a religion class every semester, but those classes are treated as seriously as the required PE classes. As a result, no bishop, stake president, mission president, area or general authority ever had to formally study religion in order to secure his position. Aside from Nibley, the BYU religion department was such a joke that the church finally bought FARMS (an independent think tank at the time). The church is run mostly by people who mostly know what they know through osmosis. The scriptural “expert” in any local ward is usually some guy who took it up as a hobby. Church officials spin and dissemble about Mormon theology because they can’t say what they really feel, which is: “Who cares?” They honestly lack the dialectical tools to understand what the big deal is all about. You might as well try to explain calculus to a kid who can barely add. So they stick their fingers in the wind and drift in whatever direction offers the least resistance, while taking care not to alienate the “true believers.” Not calling Mormons “Christian” hurts their feelings. But for no fault of their own, they won’t understand the reasons why. The first witness took the stand on March 2, 1904. Name? “Joseph F. Smith.” Place of residence? “Salt Lake City.” Title? “President of the church.” To the chief prosecutor, Smith was underplaying the power he held over the LDS faithful. “Are you prophet, seer and revelator?” he demanded to know. Smith said he “supposed he was.” …….The Smoot hearings, not unlike the 2002 Winter Olympics, brought scrutiny to the LDS Church, but also an opportunity to make the church more mainstream. So when the prosecutor asked if he received ‘revelations’ Smith replied that he received ‘guidance’ from God, ‘the same as any other member of the church.’ When word got back to Salt Lake City….his answer troubled many faithful Mormons who believed that the prophet got revelation, not just inspiration. For them, it was revelation that launched plural marriage, which some LDS leaders authorized and even performed well after church President Willford Woodruff’s 1890 ‘Manifesto’ that the church intended to obey federal anti-polygamy laws. Four apostles had taken additional wives after that. To me, the fact of the matter is that the LDS at that point made a conscious decision to go mainstream, not due to revelation but due to expediency. They want the “Christian” label for what it can gain for them. They were willing to get rid of the core doctrine of their Church in order to be accepted. No wonder the FLDS sees the Utah LDS as apostates. Seriously, I would have thought that this post would have generated more heat than it has. You stated that Mormons are not Christians and compared our situation with Mormons to Mormons’ situation with the FLDS. These are issues which have historically generated much heat. This is right on – Church officials spin and dissemble about Mormon theology because they can’t say what they really feel, which is: “Who cares?” They honestly lack the dialectical tools to understand what the big deal is all about. It is not in the LDS orientation, or dialectic, to make a big fuss over certain doctrines (that is unless one is defending the church from outsiders). The huge range of belief within LDS circles is evidence of that. BTW, does anybody know where the picture of the staute for the post was taken? What and where is it? The photo was taken by Peter Blapps. 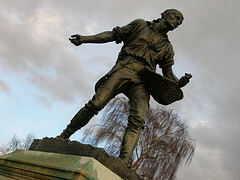 If you click on it you will find yourself taken to his flickr site, which says that the photo is titled “Sower” and was taken at Kew Gardens in England. It’s used here under the Creative Commons license. Nice photo, isn’t it? I like your “Who cares?” comment regarding Mormons and their “theology”. Mormonism centers of the “personal testimony” of the individual Mormon. When you’re hearing from god on a regular basis and understand that god is more than likely to change course at any moment, theology and doctrine doesn’t really matter. Besides, theology and doctrine are sooooo boring when compared with this continual flow of spiritual conscousness. That’s why we get Mormons copping this attitude of spiritual superiority. It’s also why the prophetic test regarding past proclamations of the leadership can be so easily dismissed. The FDLS really holds fast to what Mormonism was historically. The Utah reformed Mormon bunch are disowning their past. I have to admit, I agree with them completely. But what I don’t agree with is when it happened. I believe it happened in the 1800’s, when a man by the name of Joseph Smith decided to infuse a distrust into the Word of God so that he can institute new Doctrine when and how he pleased. What use is the Bible anymore? If its words cannot be completely trusted upon and we have latter-day revelation from God and this perfect Book of Mormon!